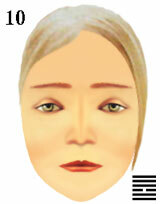 Gallery of facial features for cosmetic make-up. Art of cosmetic make-up should not mask human emotions, as people will perceive features of a woman face as a mask, that is necessary to consider for visagistes and facial stylists. Quiet eyebrows - denying of ideas. Joyful eyes seem calm as eyebrows and mouth express quiet emotions. Quiet eyebrows and mouth seem glad as eyes express joyful emotions. Facial pleasure of the person is calm as gladness is not shown in feelings, and ideas do not realize joy. Desires of the person are shown abstract from world around as ideas and feelings are absent. physiognomic emotions as a mask for cosmetic make-up.